Click to listen to episode (4:14). Unless otherwise noted, all Web addresses mentioned were functional as of 3-15-19. From the Cumberland Gap to the Atlantic Ocean, this is Virginia Water Radio for the week of March 18, 2019. This week, that raspy call opens an episode about several species of small frogs that share a common group name but differ in sound and distribution. Have a listen for about 10 seconds to two species recorded simultaneously, and see if you know the name of this frog group. And here’s a hint: to get the key word, gather a lot of harmonious singers, or skip over a song’s verses. If you guessed chorus frogs, you’re right! You heard the creaky call of Mountain Chorus Frogs along with the single notes of Spring Peepers, two of seven chorus frog species in Virginia. 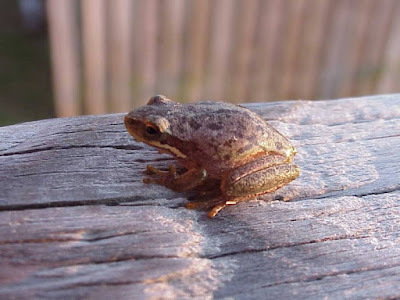 The other five are the Little Grass Frog and four more species with “chorus frog” in their name: Brimley’s, New Jersey, Southern, and Upland chorus frogs. As a group, they’re noted for their choruses of calling males advertising for mates in breeding season. Those calls vary among the species in pitch, tone, and how quickly sounds are repeated. 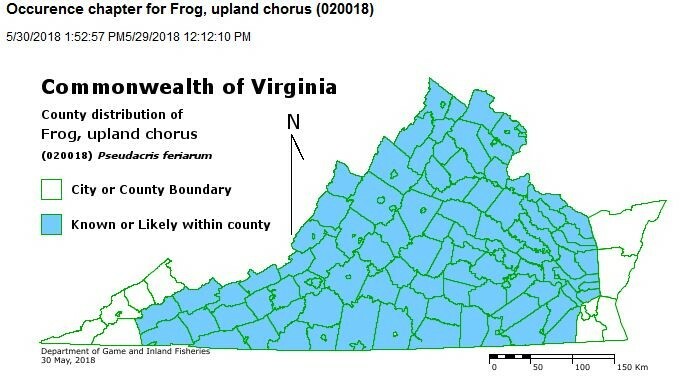 The species also differ in their distribution in Virginia: Spring Peepers occur statewide, and Upland Chorus Frogs are found in much of the state, but the other five occupy narrower ranges in the Commonwealth. The Mountain Chorus Frog, which in Virginia is found primarily in the southwestern corner, is getting special scientific attention in 2019. Scientists Kevin Hamed, at Virginia Highlands Community College in Abingdon, and Wally Smith, at the University of Virginia’s College at Wise, are leading a project this year to learn more about that species’ distribution. Collaborating with the Virginia Department of Game and Inland Fisheries, and funded by the Wildlife Foundation of Virginia, they’re inviting other Virginians, especially K-12 students, to look and listen for this species and to submit information on any encounters. To learn more about the project, or to submit Mountain Chorus Frog observations, go online to vhcc.edu/mtchorusfrog. 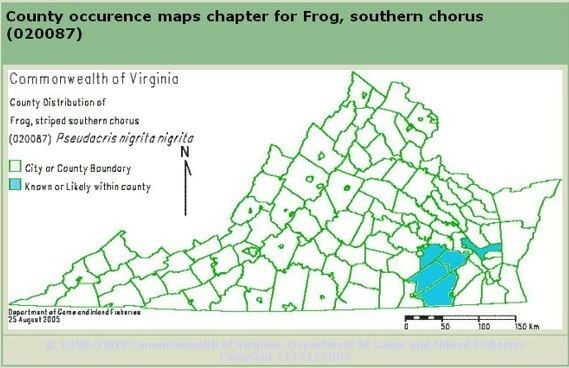 Thanks to the Virginia Department of Game and Inland Fisheries and to Lang Elliott for permission to use this week’s sounds, from A Guide to the Frogs and Toads of Virginia. 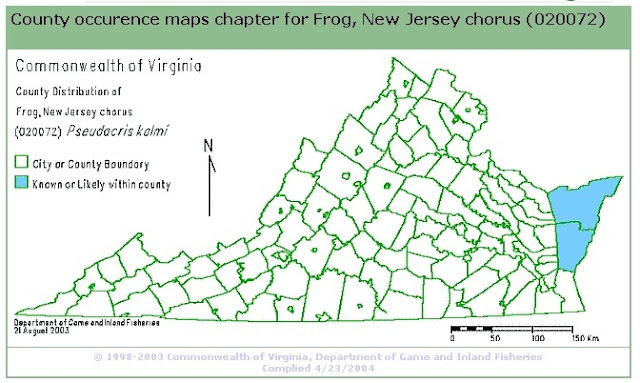 We close with a medley of calls from the seven chorus frogs found in Virginia, in alphabetical order. Have a listen for about 20 seconds, and see if you can recall their names. 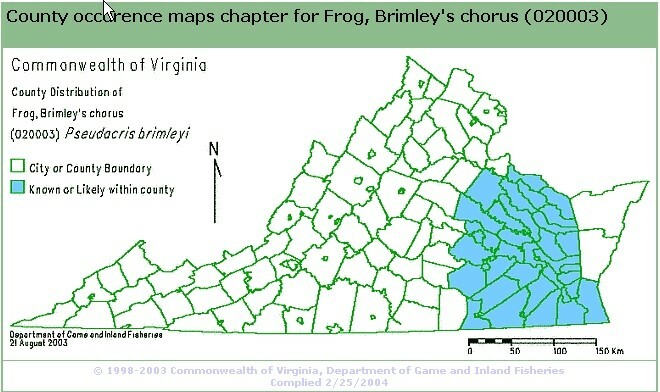 SOUNDS - ~ 22 sec – Short call segments of Brimley’s Chorus Frog, Little Grass Frog, Mountain Chorus Frog, New Jersey Chorus Frog, Southern Chorus Frog, Spring Peeper, and Upland Chorus Frog. The frog sound in this episode were from “The Calls of Virginia Frogs and Toads” CD, copyright 2008 by the Virginia Department of Game and Inland Fisheries and Lang Elliott/NatureSound Studio, used with permission. For more information, see http://www.shopdgif.com/product.cfm?uid=1928838&context=&showInactive=N, or contact the Department at P.O. Box 90778, Henrico, VA 23228-0778; phone: (804) 367-1000 (VTDD); e-mail: dgifweb@dgif.virginia.gov. Lang Elliott’s work is available online at the “Music of Nature” Web site, http://www.musicofnature.org/. Wally Smith, University of Virginia’s College at Wise. Poster being used for the Mountain Chorus Frog monitoring initiative being conducted in 2019 by Virginia Highlands Community College, University of Virginia’s College at Wise, and the Virginia Department of Game and Inland Fisheries. Poster accessed at http://web.vhcc.edu/mtchorusfrog/index.html, 3/14/19. A chorus frog (possibly Southern Chorus Frog) in Back Bay National Wildlife Refuge in Virginia. Photo made available for public use by the U.S. Fish and Wildlife Service's National Digital Library, online at http://digitalmedia.fws.gov, accessed 3-14-19; specific URL for the photo is https://digitalmedia.fws.gov/digital/collection/natdiglib/id/12030/rec/1. Below are Virginia county occurrence maps for the seven chorus frog species found in Virginia, all except Upland Chorus map from the Virginia Department of Game and Inland Fisheries (VDGIF), “Wildlife Information,” online at https://www.dgif.virginia.gov/wildlife/information/, accessed 3/12/19. 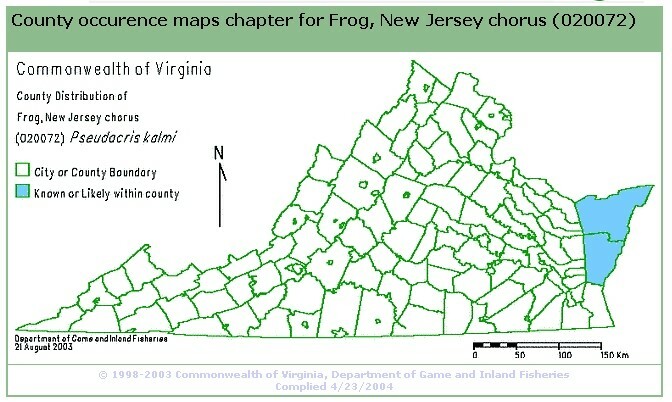 Map for Upland Chorus Frog accessed from VDGIF, “Virginia Fish and Wildlife Information Service/Upland Chorus Frog, online at https://vafwis.dgif.virginia.gov/fwis/booklet.html?Menu=_.Occurrence&bova=020018&version=17967. The maps show the scientific names for each species. Virginia Herpetological Society, “Frogs and Toads of Virginia,” online at https://www.virginiaherpetologicalsociety.com/amphibians/frogsandtoads/frogs_and_toads_of_virginia.htm. 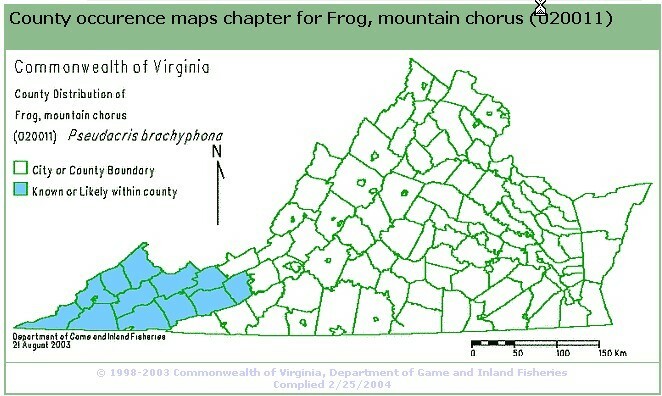 Virginia Highlands Community College and the University of Virginia’s College at Wise, “Mountain Chorus Frog,” online at http://web.vhcc.edu/mtchorusfrog/index.html. This is the Web site for the Mountain Chorus Frog monitoring initiative being under taken by these two colleges and the Virginia Department of Game and Inland Fisheries. Donna Morelli, Catch the spring action at a vernal pool near you, Bay Journal, 2/8/18. This article on amphibian breeding in spring temporary pools, known as “vernal pools,” includes a list of local parks and other areas in the Bay watershed areas of Virginia, Maryland, and Pennsylvania that sponsor amphibian monitoring or viewing events. U.S. Geological Survey (USGS), National Amphibian Research and Monitoring Initiative, online at https://armi.usgs.gov/. 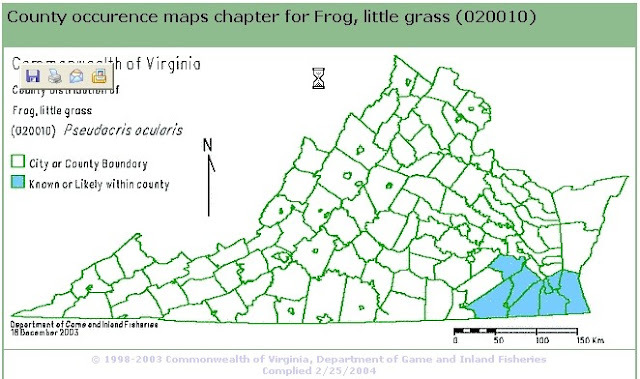 Virginia Department of Game and Inland Fisheries, “Virginia Frog and Toad Calling Survey,” online at http://www.dgif.virginia.gov/wildlife/frogsurvey/; part of the North American Amphibian Monitoring Program, online at https://www.pwrc.usgs.gov/naamp/. The Spring Peeper was featured in Episode 105, 4-2-12. A monitoring initiative for the Eastern Spadefoot was featured in Episode 357, 2-27-17. The Mountain Chorus Frog’s call was also part of Episode 408, 2-19-18. BIO.6 – bases for modern classification systems, including structures, biochemistry, and developmental stages.